You may want to grow many different things in your vegetable garden, but weeds probably aren’t on your favorite edibles list. 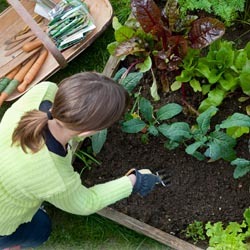 Weeding can be an enormous time-drain and is one of the the least liked gardening chores. What’s wonderful is that we have so many weed control methods to choose from; there’s a solution for every type of gardener and their schedule. When it comes to vegetable gardening, many gardeners are very particular about what goes into their soil and onto their plants, as it will eventually end up on their plates and in their bodies. Here are some indisputable safe and effective ways to control weeds, without chemicals, in your veggie or any other garden for that matter. Apply corn gluten meal to prevent weed seeds from germinating (don’t use if direct seeding your garden as all seeds will be affected). Plan your garden to crowd edible plants together, effectively crowding out weeds because there isn’t space left for them to grow. Manually pull weeds when the soil is wet and roots are looser. This can be done after a natural rainfall or after supplemental watering. Hoe when the soil is dry to break apart weeds and damage their roots. Pick up larger weeds after hoeing so they cannot reestablish themselves. Mulch with salt hay which contains no weed seeds. The hay will shield weed seeds from the sunlight and moisture they need for germinating. Lay biodegradable and compostable mulch film down to create a firm barrier to keep weeds out or to prevent existing weed seeds from germinating. Attract seed-loving birds such as finches and sparrows, which will happily eat hundreds of weed seeds each day for natural control. Consider raised beds or container gardening to more effectively control weeds and make any remaining weeding easier. Use fire (with all appropriate safety precautions) to burn out unwanted weeds, especially in pathway areas or along garden borders. Treat exposed weeds with boiling water – the hotter the better – to cook and kill them. Several treatments may be needed for the best effects. Weeds can be some of our worst enemies in the garden, and it is impossible to eliminate every single weed all the time. By using multiple methods and keeping on top of the task, however, it is possible to minimize weeds and make this chore less onerous, without resorting to harsh chemicals.